Epsom & Ewell Borough Council has set up a new fund to help people who may be at risk of suffering health and safety problems due to issues in their homes. 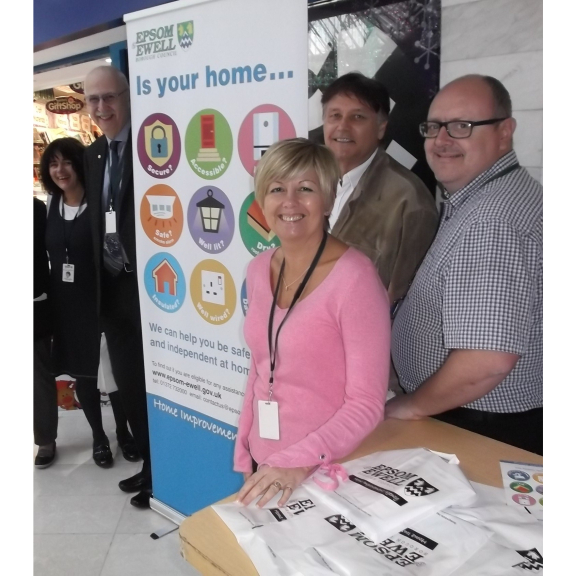 A team from the Council were at the Ashley Centre today to promote the launch of the scheme and will also be at Bourne Hall on Wednesday 6 December. Grants are being offered to the most vulnerable in our community where they do not have the resources or support to undertake remedial action to their homes themselves. Help will be provided for home owners and for those renting properties where the requirement falls outside a landlord’s responsibilities. Examples of assistance could be replacing or repairing a boiler, fitting keychains and other security measures, fitting grab rails, fixing guttering, remedying dampness, mending an electrical fault or renewing a front door. Councillor Barry Nash, Chairman of the Community and Wellbeing Committee, said “we are aware of many residents who are trapped in a home they cannot, or don’t want to, leave but are unable to maintain it. They find it unbearable, are insecure or are having to live in unhealthy discomfort. “This funding will allow these individuals to stay in their own homes, safe and healthy, at a minimal short-term cost to the public purse but mitigating higher long term costs caused by the detrimental living conditions”. This initiative is in addition to the council’s existing disabled facilities support grants which offer adaptions to the home to help with issues such as bathing, stairs and access to the home. Eligibility is dependent on the age of the applicant and receipt of certain income or related benefits. The grant is discretionary and there is a very limited budget. Enquiries will be prioritised according to the urgency of the works and the applicant's individual circumstances.